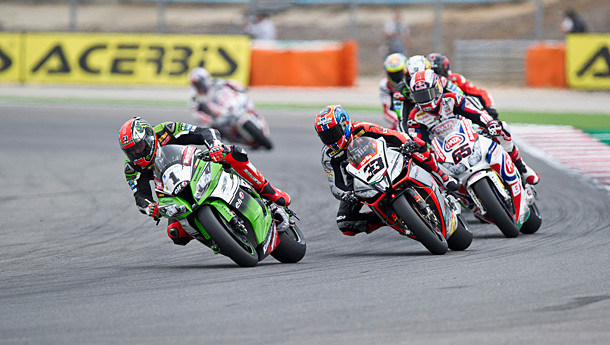 Changeable weather played a big role in the 8th WSBK round’s race day at Portimao’s Autodromo Internacional do Algarve. This year’s Portuguese races were held in opposite track conditions and saw different podium finishers in the two encounters. Reigning champion Tom Sykes (Kawasaki Racing Team), pictured above, won a dry Race 1 ahead of Sylvain Guintoli (Aprilia Racing Team) and teammate Loris Baz, whilst in Race 2 Jonathan Rea (Pata Honda World Superbike) was victorious under wet conditions, with the Ducati Superbike Team duo Davide Giugliano and Chaz Davies completing the top-3. The main turn of events of the day took place in the second encounter, when Marco Melandri and Sylvain Guintoli collided and crashed on lap 13 following an overtaking attempt by the Frenchman on the Italian rider. Guintoli was able to rejoin the race, eventually finishing in 7th position, whilst Melandri’s charge to the top drew to a close on the run off area of the track. No trouble in the wet for Jonathan Rea taking out race 2. Sykes, who was 8th at the finish line in Race 2, took advantage of this situation and now leads the title race by 43 points over Guintoli, as the series heads to Laguna Seca for the second back to back round before the summer break. 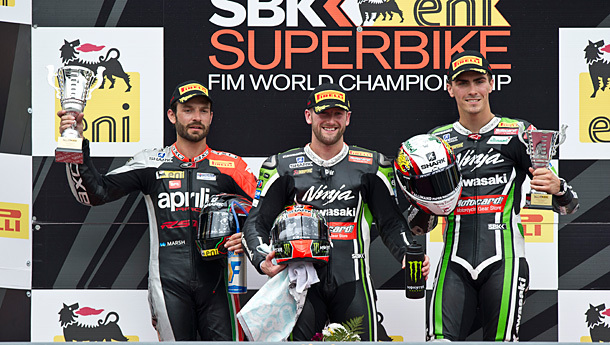 An enthralling 20 lap race 1 saw Tom Sykes (Kawasaki Racing Team) emerge victorious at a cloudy and overcast Portimao to claim his seventh win of the season and the 21st of his WSBK career. Sykes leads the way from Marco Melandri (33) and Jonathan Rea (65). At the start it was Pata Honda’s Jonathan Rea that took the holeshot, leading for the opening three laps before Sykes and Marco Melandri (Aprilia Racing Team) overtook him into turn one at the start of lap four. By half distance the constant swapping of positions had allowed reigning champion Sykes to stretch his lead to 3 seconds, before seconds later the white flag was waved to indicate that rain was beginning to fall. Behind the leader five riders that included Loris Baz (Kawasaki Racing Team), Chaz Davies (Ducati Superbike Team), and Sylvain Guintoli, Leon Haslam on the second of the Pata Honda’s slowly began to close the gap, giving the fans a six rider group battling for the podium places. Leon Haslam collided with Chaz Davies, both riders able to remount with Davies later retiring. Haslam eventually finished 11th. Race 1 podium L-R Sylvain Guintoli, Tom Sykes and Loris Baz. At the front Sylvain Guintoli (Aprilia Racing Team) had elevated himself to 2nd and began to quickly reduce the gap to Sykes before he responded to retain a lead of 2 seconds until the flag. Guintoli made his return to the podium in second ahead of compatriot Baz, with Marco Melandri 4th. Jonathan Rea faded to a lonely 5th ahead of Alex Lowes (Voltcom Crescent Suzuki) who passed Ducati’s Davide Giugliano and his team-mate Eugene Laverty on the final lap to finish 6th. Eugene Laverty (58), Christian Iddon (2) and Toni Elias (24). Sylvain Barrier (BMW Motorrad Italia Superbike Team) and David Salom (Kawasaki Racing Team) were never more than 0.1s apart for the entire race with Salom, eventually coming out on top by 0.014s on the line to claim the EVO honours. Toni Elias (Red Devils Roma Aprilia) crashed out after improving from his lowly grid position whilst Fabien Foret (Mahi Racing Team India Kawasaki), Geoff May (Team Hero EBR), both Grillini Kawasaki riders Bryan Staring and Sheridan Morais, Peter Sebestyen (Team Toth BMW) and Chaz Davies all retired. 1. Sykes (Kawasaki) 20 Laps/91.840 km in 34’45.568 average 158.529 kph; 2. Guintoli (Aprilia) 2.539; 3. Baz (Kawasaki) 3.175; 4. Melandri (Aprilia) 4.042; 5. Rea (Honda) 7.791; 6. Lowes (Suzuki) 14.772; 7. Giugliano (Ducati) 14.877; 8. Laverty (Suzuki) 14.941; 9. Salom (Kawasaki) 26.018; 10. Barrier (BMW) 26.032; 11. Haslam (Honda) 33.041; 12. Guarnoni (Kawasaki) 38.385; 13. Canepa (Ducati) 42.237; 14. Russo (Kawasaki) 47.908; 15. Andreozzi (Kawasaki) 1’03.502; 16. Yates (EBR) 1 Lap; 17. Rizmayer (BMW) 1 Lap;18. Davies (Ducati) 5 Laps; NC. Staring (Kawasaki); RT. Sebestyen (BMW); RT. Morais (Kawasaki); RT. Elias (Aprilia); RT. Foret (Kawasaki); RT. May (EBR); SH. Badovini (Bimota) 34.442; SH. Iddon (Bimota) 38.246. 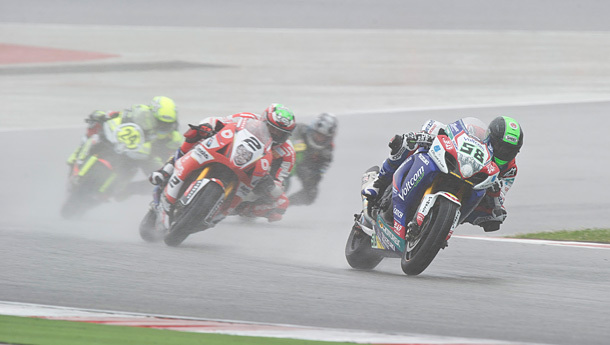 The second race of the day at Portimao was held in tricky conditions as the rain which began during the Supersport race continued to fall at the Portuguese circuit. 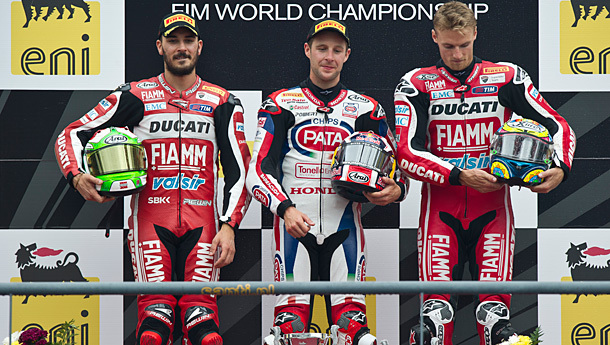 On the podium after race 2, L-R Davide Giugliano, Jonathan Rea and Chaz Davies. Jonathan Rea (Pata Honda World Superbike Team) romped home after a reduced race distance of 18 laps as the winner after Sylvain Guintoli and his team-mate Marco Melandri collided at turn five in the closing stages. Guintoli was able to remount eventually finishing 7th. Behind Rea, Davide Giugliano was a lonely second with Chaz Davies snatching the final podium spot from Alex Lowes and Leon Haslam after an enthralling final few laps in which third position changed several times. Loris Baz finished sixth. Sykes finished race two a lowly 8th after dropping back through the pack. He was passed on the penultimate lap by the recovering Guintoli who salvaged 7th at the flag. In the EVO battle the honours in race 2 went to Sylvain Barrier, the Frenchman finishing 11th overall. 1. Rea (Honda) 18 Laps/82.656 km in 34’55.154 average 142.024 kph; 2. Giugliano (Ducati) 6.817; 3. Davies (Ducati) 8.676; 4. Lowes (Suzuki) 9.740; 5. Haslam (Honda) 11.289; 6. Baz (Kawasaki) 11.808; 7. Guintoli (Aprilia) 14.169; 8. Sykes (Kawasaki) 17.164; 9. Laverty (Suzuki) 26.406; 10. Elias (Aprilia) 30.168; 11. Barrier (BMW) 41.820; 12. Morais (Kawasaki) 47.434; 13. Guarnoni (Kawasaki) 50.045; 14. Staring (Kawasaki) 1’17.436; 15. Russo (Kawasaki) 1’24.500; 16. Andreozzi (Kawasaki) 1’30.563; 17. Salom (Kawasaki) 1’34.242; 18. Canepa (Ducati) 1’34.647; 19. Rizmayer (BMW) 1’47.422; RT. Melandri (Aprilia); RT. May (EBR); RT. Yates (EBR); NS. Sebestyen (BMW); SH. Badovini (Bimota) 26.263; SH. Iddon (Bimota) 33.831. 1. Sykes 284; 2. Guintoli 241; 3. Baz 236; 4. Rea 235; 5. Melandri 192; 6. Davies 159; 7. Giugliano 140; 8. Laverty 121; 9. Elias 115; 10. Haslam 115; 11. Lowes 111; 12. Salom 74; 13. Canepa 46; 14. Camier 30; 15. Guarnoni 26; 16. Barrier 17; 17. Scassa 16; 18. Foret 14; 19. Morais 14; 20. Corti 13; 21. Andreozzi 10; 22. Allerton 6; 23. Bos 5; 24. Staring 5; 25. Goi 5; 26. Russo 5; 27. Toth 2; 28. Fabrizio 2; 29. Lanusse 1. Manufacturers: 1. Kawasaki 301; 2. Aprilia 273; 3. Honda 235; 4. Ducati 207; 5. Suzuki 179; 6. BMW 53; 7. MV Agusta 13. After a titanic race at Portimao Michael Van Der Mark (Pata Honda World Supersport Team) has taken the 8th round victory in this year’s World Supersport championship after overcoming immense pressure from Jack Kennedy (CIA Insurance Honda) and former champion Kenan Sofuoglu (Mahi India Racing Team) who completed the podium. Michael van der Mark after his brilliant win in World Supersport. Misano race winner Jules Cluzel (MV Agusta Reparto Corse) looked like making it a four rider fight before the Frenchman overshot at turn three before eventually retiring. The opening half of the race gave the fans a real treat with some of the closest WSS racing of the year before championship leader Van Der Mark edged clear in the closing stages to win his 4th race of the year after a red flag because of rain stopped the race on lap 13. Today’s result means that the Dutchman has never finished lower than second all season with the exception of his Phillip Island crash. For Kennedy it was his first podium finish after moving into World Supersport, the Irishman finally showing his true potential. First podium finish in World Supersport for No.4 Jack Kennedy. Behind the top three Raffaele de Rosa rode well to bring the second CIA Insurance Honda home in 4th ahead of PJ Jacobsen (Kawasaki Intermoto Ponyexpres) and Lorenzo Zanetti. (Pata Honda World Supersport Team). 1. Vd Mark (Honda) 12 Laps/55.104 km in 21’15.438 average 155.534 kph; 2. Kennedy (Honda) 1.649; 3. Sofuoglu (Kawasaki) 1.961; 4. De Rosa (Honda) 8.042; 5. Jacobsen (Kawasaki) 8.095; 6. Zanetti (Honda) 8.538; 7. Coghlan (Yamaha) 11.045; 8. Marino (Kawasaki) 11.847; 9. Rolfo (Kawasaki) 12.624; 10. Roccoli (MV Agusta) 15.448; 11. Wilairot (Honda) 17.152; 12. Nocco (Kawasaki) 24.774; 13. Bussolotti (Honda) 24.839; 14. Debise (Honda) 25.022; 15. Menghi (Yamaha) 25.238; etc. 1. Vd Mark 160; 2. Cluzel 107; 3. Marino 93; 4. Sofuoglu 83; 5. Zanetti 80; 6. Coghlan 77; 7. Jacobsen 67; 8. De Rosa 67; 9. Rolfo 62; 10. Tamburini 48; 11. Kennedy 43; 12. Wilairot 35; 13. Bussolotti 30; 14. Wahr 26; 15. Russo 25; 16. Gamarino 22; 17. Menghi 20; 18. Nocco 20; 19. Leonov 15; 20. Gowland 9; 21. Roccoli 8; 22. Zaidi 7; 23. Coveña 7; 24. Schmitter 3; 25. Calero 3; 26. Debise 2; 27. Rogers 1. Manufacturers: 1. Honda 181; 2. Kawasaki 135; 3. MV Agusta 121; 4. Yamaha 87; 5. Triumph 9.